Can you believe that the dress above started from a pattern that looked like this? What a sultry look eh? I found the material at a bargain price in a furnishing fabric store but thought it was pretty enough to make something wearable with. It was more an experiment to learn a few new techniques for me as now that I´ve finished the dress, I realise that I don´t really have anywhere I could wear it! I don´t think the chickens would appreciate it and I´m not sure it would go so well with my wellies. The dogs probably wouldn´t take much notice of it either on our walks. Hey ho, I´ll put it back in the wardrobe for now and wait for an invitation to a Vintage Style Garden tea party. I had a good play around with the pattern. I realised that the pleating in the bodice would do me no favours, so took the original one in. 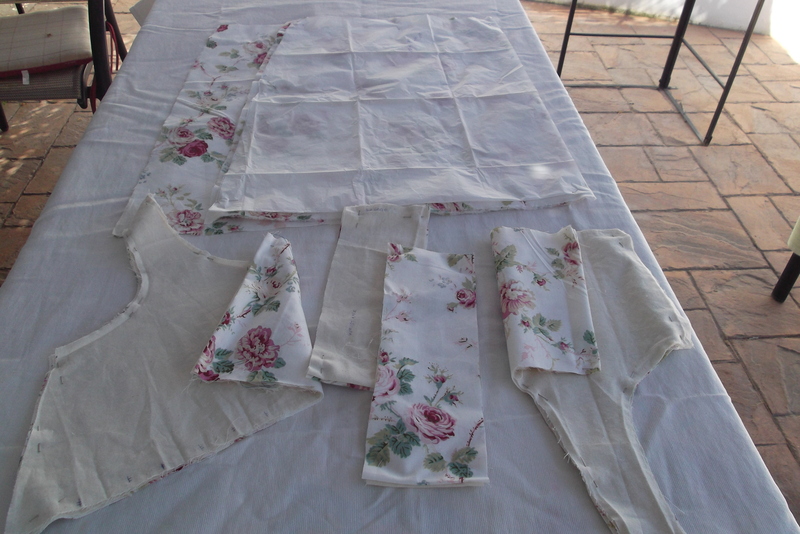 Then I cut it out according to the adjustments I had made in my muslin. I took time to finish the edges properly. 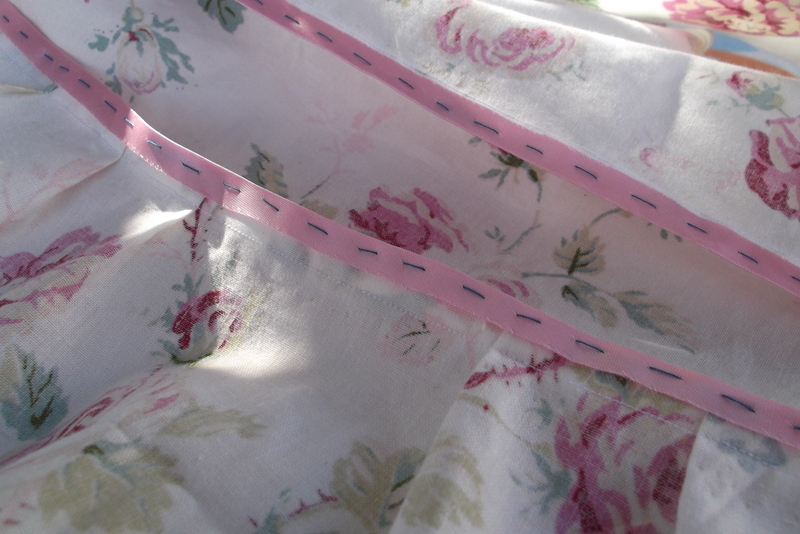 Unbelievably a little local shop had some pretty satin bias binding which I used to cover the inner seams and finish the hems and edges with…I got a bit carried away as I liked it so much. These were then hand finished. 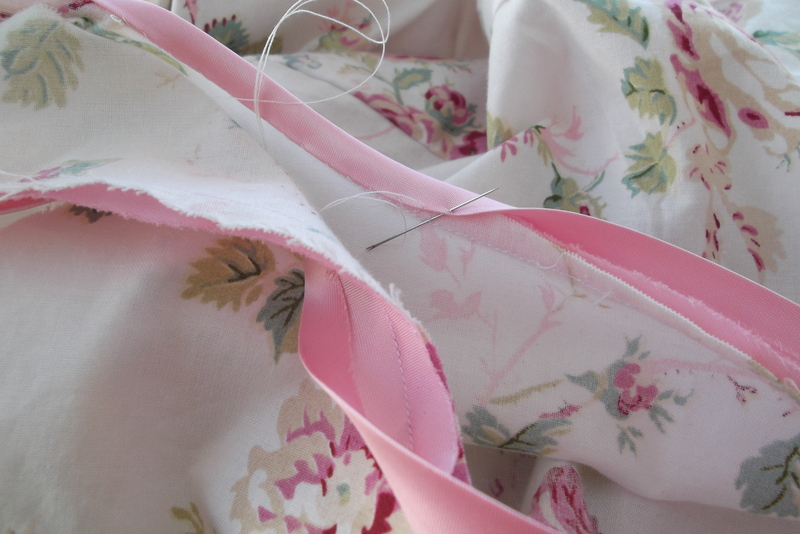 Love sewing by hand! Finally I decided to add some cap sleeves. 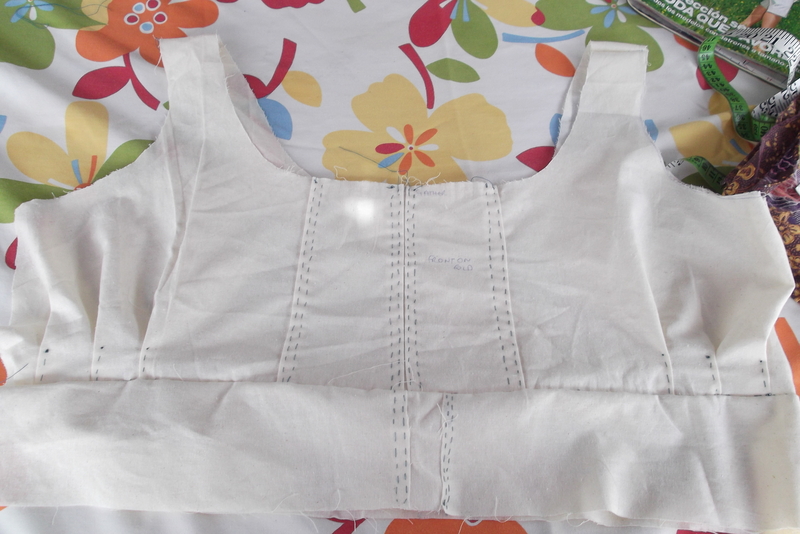 I´m happy with how it turned out and may well use the muslin to make up another dress in a more “useable” fabric. I was expecting tea and cucumber sandwiches – nice dress! Recipe or not, it is a lovely fun post, brought a smile to my face. As for the sewing….I am impressed. Take care and have a fun day. Thank you – always a good thing when I can make someone smile! Hola y muchisimas gracias por tus palabras tan graciosas! Y si, tienes razon, ¡tengo que poner mi vestido y salir a un sitio “fancy”! Thank you Tandy! I think most of us are not perfectly symmetrical…I guess we´d look odd if we were! I don’t even know if my shoulders are wonky. But this is a tad short for me. OK, seriously, I admire your sewing talents. You make me laugh Greg and thanks for commenting on something which must be very dull for you…and I bet you have got wonky shoulders…we all seem to! (Especially if we carry laptops around). This is TOO CUTE! I love it! Makes me want to get out the ol sewing machine and see what I could do. Aaah – thank you! It is rather cute isn´t it…will just have to make tea and cakes and have a tea party all of my own 🙂 And do get that sewing machine out, it´s fun to “create”. The dress looks beautiful! You have a wonderful talent. I have a sewing machine, but I do not make dresses. I´ve only just started to make dresses – it´s challenging to say the least! So, so pretty! You will just have to throw your own garden party! I’m so jealous of your dressmaking; I wish I could get back into it….and possibly viewing more of your sewing posts I just might!! Thank you – will have to bake scones and a victoria sandwich. Very English! The problem with sewing is that it takes time and space…if you have to pack stuff up all the time it´s a lot more difficult. Well done! I feel I must say, however, that even though you got me to can jam & ketchup, I will state, with a great deal of certainty, that I won’t be doing any dressmaking for quite some time to come — like never. Ah, I don´t know. Maybe we´ll soon be seeing a post where you´ve cooked something amazing and it´s all set out on an incredible tablecoth with matching napkins that you´ve made 🙂 …or maybe not! You’re so clever, I’ve never sewn anything in my life, not even a button! And I totally disagree with you about it not going with the wellies- it’s very 40’s/land girls/Glastonbury which is SO this season. I know what you mean though, I’m always overdressed if I ever go out here, but I don’t care and there’s a lovely 3 tier cake stand in Ikea that would be perfect for your afternoon tea dress!! I love that 40´s and 50´s look! Mind you, most of the Spaniards I know think I´m a little bid odd dress-wise (mainly because I don´t wear either an evening dress or a suit to the Fiesta 🙂 ) I have the 3 tier glass fruit stand which I use as a cake stand, but I think you mean the pretty one which I am lusting after…now I have the perfect excuse to buy it! The vote seems to be to wear it with my wellies – think I may just have to do it for the sheer hell of it! Thanks for your lovely words…I really enjoy sewing, but at least with cooking I can eat the results, so I think that wins over as my favourite! I am really impressed! 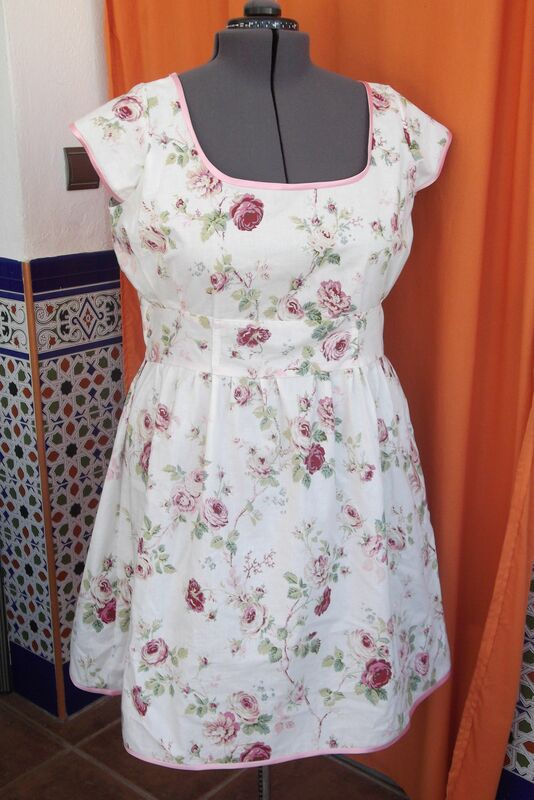 This is a lovely floral dress! You have to find an excuse to use it Chica!!!! Maybe a romantic dinner with Big Man or a romantic night out?? Great post! I think I´m going to have to sort out a romantic “date night” with Big Man! He was really impressed with the dress and helped me sort out the shoulder problems…bless him! And thanks to you too for visiting me! I didn´t used to be able to sew but am learning as I go along. Have made quite a few horrors that went back into the scrap bag in my time! I wish you could make one for meee!! Oh what a beautiful dress! I think you should wear it when you and your hubby have sun downers – wellies *optional extras*. How special that you can sit outside and sew! 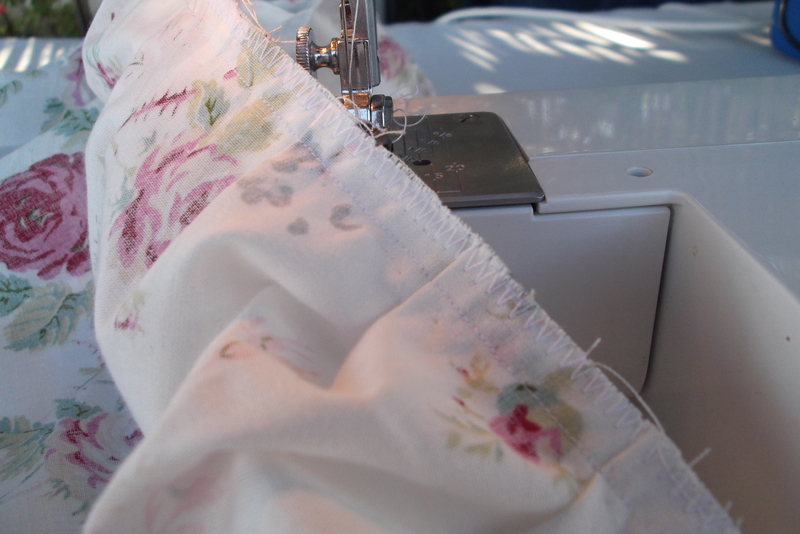 I wish I had inherited my moms knack for sewing – she even make my wedding gown and all of my suits when I was working! Hi Chica. I love this dress. Fabulous material. Wellies or kickers will definately go with it! Need a big basket as well to put cut flowers in. Thank you so much – it was fun making it and I learnt a lot doing the adjustments (as it was a case of having to 🙂 ) Go on…get those pins and needles out! Have to say I only did a couple of terms of needlework classes at school and I hated it…maybe they just don´t teach it so well! Excellent! Why not wash the muslin dress to make sure it is fully shrunk – then make sure it still fits, and DYE IT! Damn – I took it apart to use the skirt again but it´s a great idea for the next project! Aah thank you for your lovely comment – will have to check out that website! A gorgeous dress, and I envy you your patience in doing it all ‘properly’. I’m sure it’s worth the effort, but I’ve never made a muslin pattern! I never used to but then spent ages refitting the more fitted things I made. 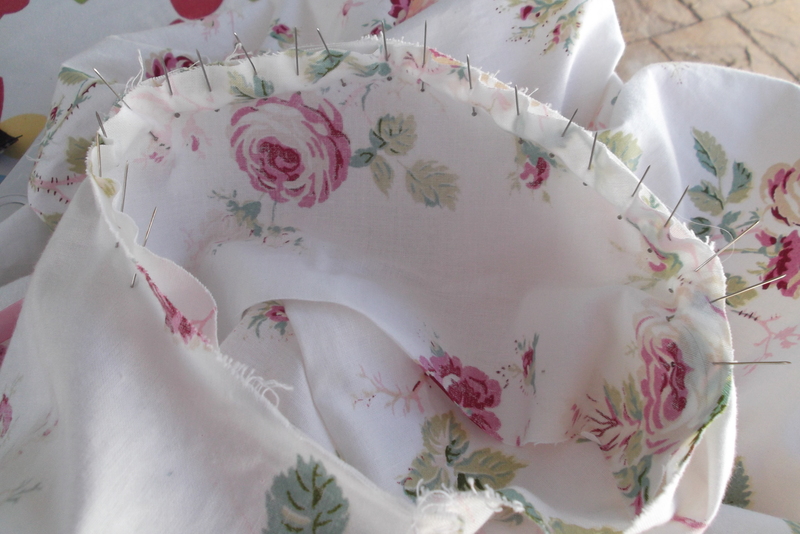 I don´t do this for simple stuff … it would take so long and use up so much “muslin”! Thank you for your kind words and welcome home after your trip! Wow, great job on the dress! The satin binding is especially pretty. Thank you so much – I really enjoyed finishing it off with the binding. Very pretty dress. The pink satin binding is my favorite thing about it. Thank you and lovely to see you here! I really enjoyed making this dress and I think the binding really sets it off – I like hand sewing so it was fun to sew the back seams on it. Luckily bobbins are really cheap here (not sure why!) so I have a good supply as I had the same problem too. A friend of mine gave my machine a good overhaul earlier this year – it seized up completely. It is nice to have some space that I can leave everything out (and in a mess!). Am now thinking of winter projects…although we are still having warm weather, I know it will change soon. Love how you’ve made the style your own. And is that a Patrones pattern book I spy, you lucky thing? Thank you, thank you! And yes, it´s a Patrones magazine – I only discovered pattern magzines a few months ago and people seem to be very keen on this one. They have some nice stuff and last month did a special on bigger sizes (yay!). I have to admit to never having seen a copy other than on blogs as it’s very difficult to get hold of here. In truth Burda is also tricky, but I’ve managed to get this months copy quite by chance. I love Burda as the styling is so lovely, although they do insist on including some decidedly hinky crafts each month and periodically do rather strange folk costumes. But you can forgive them as the patterns are mostly quite lovely. You´re right – this month we had Oktoberfest type outfits. Fine I guess in Munich, but not for everyone! I try to buy Patrones when I can, didn´t realise it was hard to get outside of Spain. If I find any old ones with patterns still in them will have to send them to you! Thank you – myabe one day I´ll “model” it. I´m shy!! Don’t be shy! We’re all friends here. I’d be delighted to receive any old Patrones and will of course reimburse you. You’re too kind. Ah thanks! WIll see if I can track down any old copies for you and will let you know if I have any luck!